Sainte Chapelle in located in the heart of Paris, on the Ile de la Cité, not far from Notre Dameand mostly surrounded by the Palais de Justice. 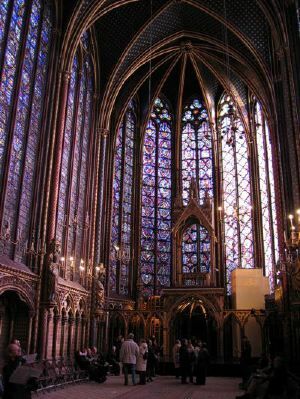 La Sainte Chapelle (The Holy Chapel) is a Gothic chapel built in what is known as the rayonnet style. It has been said to be the purest example of high Gothic architecture in the world. The reason for this can be attributed to the speed at which it was built. Begun in 1246, it was completed and consecrated on April 26, 1248, and was most likely designed by one person. No designer-builder is directly mentioned in the archives, but the name of Pierre de Montreuil has been historically connected with the chapel. Pierre de Montreuil had rebuilt the apse of the Abbey of Saint Denis and completed the façade of the Notre Dame Cathedral in Paris. The patron was Louis IX who had it built as the chapel for the royal palace. The palace itself has disappeared, leaving the Sainte Chapelle surrounded by the Palais de Justice. The Palais de Justice was where important aristocrats pleaded their cases before the king. It was built to house Christ's crown of thorns which Louis IX purchased from the Byzantine emperor, Baldwin II, at the price of 135,000 livres. Sainte Chapelle, however, cost 40,000 livres to build. A piece of the True Cross and other relics were later added. The building itself was, in effect, a precious reliquary. Politics had much to do with the building of Ste. Chapelle. The Emperor in Constantinople was, in the mind of Louis IX, only a Count from Flanders. That, and the fact that the Holy Roman Empire was at this time in great disarray, Louis IX saw an opportunity to make his city the major center of Christendom. The Royal Chapel stands squarely upon a lower chapel, which served as parish church for the inhabitants of the palace. The Palace itself was the seat of government. The most visually beautiful aspects of the chapel are its stained glass for which the stonework is a delicate frame. They are considered the finest examples of their type in the world. The rose windows were added to the upper chapel in the 15th century. During the French Revolution, the chapel was converted to an administrative office and the windows were covered by enormous filing cabinets. These file cabinets, whether by design or fortunate accident, protected the windows from the vandalism which had destroyed the choir stalls and the rood screen inside the chapel. The spire was also pulled down and the relics were dispersed. In the 19th century, Viollet le Duc restored Sainte Chapelle to its present state. The new spire is his design. Sainte Chapelle has been a national historic monument since 1862. Sainte Chapelle is open every day during March-October from 9:30 a.m.-6 p.m. During the rest of the year it is open from 9:00 a.m.-5:00 p.m. It is closed Monday-Friday from 1:00 p.m.-2:15 p.m. It is closed on December 25. Admissions are 8 euros for adults; 5 euros for those between the ages of 18-25; free for those under 18 years of age, under the age of 26 if an EU citizen, and for handicapped persons and their companion. A combination ticket of Sainte Chapelle and the Conciergerie is 11 euros for adults and 7.50 for persons between the ages of 18-25 years old.